From the National Book Award nominated, New York Times bestselling author of A Short History of Women and The Sunken Cathedral, Walbert’s beautiful and heartbreaking novel about a young woman coming of age in the long shadow of World War II—“An intricately plotted, thrillingly imagined ­narrative...A masterpiece” (The New York Times Book Review). Forty years after enduring the Second World War as a young woman, Ellen relates the events of this turbulent period, beginning with the death of her favorite cousin, Randall, with whom she shared Easter Sundays, childhood secrets, and, perhaps, the first taste of love. When he dies on Iwo Jima, she turns to the legacy he left her: his diary and a book called The Gardens of Kyoto. Each one subtly influences her perception of her place in the world, the nature of her memories. Moving back and forth through time and place, Kate Walbert recreates a world touched by the shadows of war and a society in which women fit their desires into prescribed roles. Unfolding in lyrical, seductive prose, The Gardens of Kyoto becomes a mesmerizing exploration of the interplay of love and loss. Kate Walbert is the author of six previous books of fiction: His Favorites; The Sunken Cathedral; A Short History of Women, a New York Times Book Review ten best books of the year and finalist for the Los Angeles Times Book Prize; Our Kind, a National Book Award finalist; The Gardens of Kyoto; and the story collection Where She Went. Her work has appeared in The New Yorker, The Paris Review, The Best American Short Stories, and The O. Henry Prize stories. She lives with her family in New York City. Alida Becker The New York Times Book Review An elusive first novel with understated power. The New Yorker In precise, delicate prose, the author renders with equal power the quiet desperation of a girl growing up in 1950s America and the ethereal. Elizabeth Ward The Washington Post [A]...haunting, accomplished first novel. Carol Memmott USA Today Readers in love with language will adore this book. Mark Rozzodeck Los Angeles Times There's something convincingly elegant in Walbert's prose, making this book a strange and stately object of contemplation. 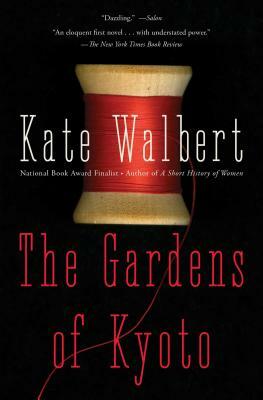 Amy Bloom Kate Walbert's fine, delicate prose captures voices that we don't hear much anymore....The Gardens of Kyoto is a ghost story, a mystery, a love story. Francine Prose Elle This lovely, original novel...[examines] the gauzy web of fictions we spin to protect our loved ones from the barbed truths of the past.